This was an early incarnation of the Turner & Kirwan of Wexford duo. 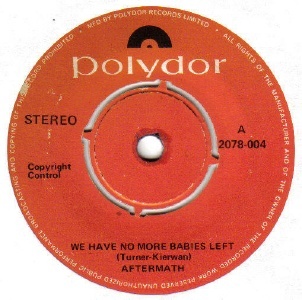 "We Have No More Babies Left" was written about the disaster in Bangladesh in 1970. A demo was sent to Jackie Hayden, head of A&R at Polydor Records, who invited the duo to record it during a 4 hour session at Trend Studios in Dublin. "Neck And Neck" was recorded in a rush when they realised they needed a recording for the B-side and is inferior to the version later recorded by Turner & Kirwan of Wexford. The single was released on Polydor Records under the name Aftermath in March or April of 1971. Information on the short career of Aftermath is sketchy. Kirwan announced plans for his own indie label called Prophet Records in 1971 to be launched by a single by Wexford group the Menapia Folk, with a Turner-Kirwan composition on the A-side "Bitter Whiskey and Sweet Red Wine" but this never came to pass. The Wexford duo assumed the Turner & Kirwan of Wexford moniker shortly afterwards and emigrated to New York.